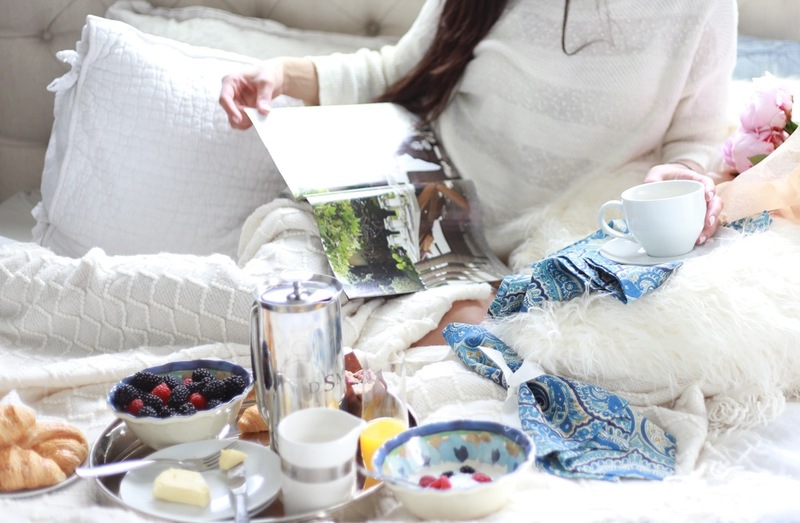 Is there anything better than breakfast in bed? A steaming-hot cup of coffee, flakey French croissants, and a fluffy bed - you can't beat it! Even better when it's a romantic breakfast for two. I loved these Pottery Barn goodies so much, I wanted to make sure one of you won the exact same set of items to enjoy with your hubby, or just by yourself on a lazy Sunday morning! So, I partnered up with Pottery Barn to do a GIVEAYAY to one lucky winner! The giveaway includes everything you see in the photos (except for the hunky husband and the yummy food), and you can scroll to the bottom of the post for deets! Enjoy! Tag as many friends as you'd like in the comment section on the Instagram posts on either of the accounts. Each tag is an entry! Reposting the giveaway gets you one more entry. Giveaway entry will close Sunday at midnight, and the winner will be announced on the original post on Monday! Good luck!